In today’s makeup look I am using my NYX Glam Liner Aqua Luxe in shade Glam Azure for the first time. I am loving NYX eye liners as they are very pigmented and long lasting, but I hate the fact that they dry up very quickly and manage to pull your skin in small wrinkles that cause an unpleasant feeling for a short while. 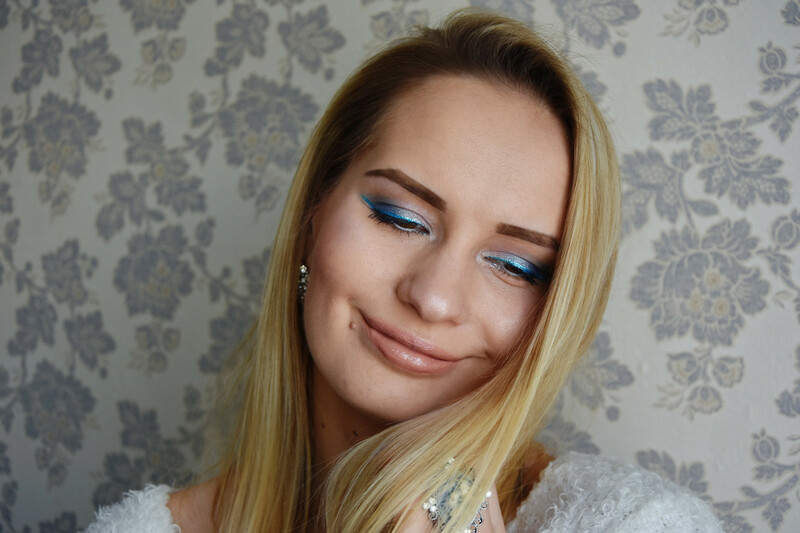 I have never played with blue glitter eye liner before, but I am definitely loving the end result and I hope you’ll like it as well! How is the weather in your home town? Pirmo reizi uzklājot grimu izmantoju manu NYX Glam Liner Aqua Luxe laineri tonī Glam Azure. Man ļoti patīk NYX laineri, jo tiem ir izcila pigmentācija un noturība, BET tie arī ļoti ātri nožūst un savā veidā sarauj ādu krunciņās, radot īslaicīgu nepatīkamu velkošu sajūtu. Nekad neesmu spēlējusies ar zilu laineri, bet man tiešām ļoti patika rezultāts un ceru, ka patiks arī jums. Kā tu pavadīji stindzinošo nedēļas nogali? Mīļš paldies! Prieks, ka patīk! haha, that is such a cool compliment! 🙂 Thank you very, very much! Wow what a gorgeous look! I hardly ever use the blue colors in any eyeshadow palette so this look is a good way to get me to use some of them! Yeah, I am not the biggest fan of blue in eye makeup either, but I think that it suits winter beautifully!